Serge Blanco's 93 caps for France were filled with outlandish levels of attacking skill and ambition. Few other players can lay claim to the legacy that Blanco assured for himself. A spellbinding runner and devilish presence on the field, he was charismatic and enigmatic off it. Images of Blanco's on-field heroics can always be viewed ironically alongside images of him strutting along the touchline nursing a cigarette. 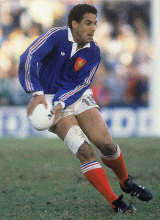 He made his debut for France against South Africa at Newlands in 1980, in a tough, hard-fought game in which his line was breached five times by the Springboks. However, Blanco broke the mould for full-backs; he was never a defensive presence to match the likes of JPR Williams but his ambition and pragmatic attitude to attacking at all costs made him an unpredictable and dangerous opponent. Blanco's brilliance was evident throughout the Five Nations championships that he played in, winning Grand Slams with France in 1981 and 1987 as well as four further titles. His finest moment may well have been in the 1991 clash with England at Twickenham. Collecting the ball under his posts after a missed penalty, Blanco charged along his own line before passing outside to wing Jean Baptiste Lafond, who streaked along the flank. Moments later Philippe Saint Andre was gathering the ball from a cross field kick and crashing over the English line. While Blanco's involvement in the try seems slight, it summed up everything about the man as a player. His choice to run out of defence was a no-risk, no-reward decision that would be alien to many of the defence-obsessed Test full-backs in the modern game. Blanco belonged to another time, summing up the beauty and flair of French rugby. He could also be seen, as with so many virtuoso players, to be alarmingly inconsistent. While the game appeared to come so easily to him, his nonchalance and unruffled demeanour sometimes led to anonymity for long periods of a game. This inconsistency could be forgiven in a player so talented, and despite his calm exterior Blanco was a fiercely committed man. He played his entire career for Biarritz, and gave his all for them despite never claiming the French championship or Bouclier de Brennus. His commitment and love for his club is also becoming a feature of the past and the amateur game, with players moving for money to franchises bearing little resemblance to the fiercely supported clubs of Blanco's era. With his heart so firmly entrenched in Biarritz, it was a wonder that Blanco could summon the same passion in the blue of France. Any doubts over his commitment to the cause can be dispelled be the final image of the 1987 World Cup semi-final, where Blanco collapsed in the Australian in-goal area, overcome with emotion, having sealed Les Bleus' place in the final with an injury-time try. Blanco was captain and talisman of the side, and was again called upon for the 1991 tournament. His French side made it to the quarter-finals, but found their way blocked by hosts England. This proved to be Blanco's final game in a French jersey, and a disappointing end to an international career that took in 38 tries, still the record for a Frenchman. Blanco's final first-class game came in the 1992 French Championship final, and although he saw his beloved Biarritz come up short that day, he retired as a great of the game, revered in France and abroad as one of the game's most entertaining and valuable free-spirits.